Digital communication and marketing tactics may be the hottest topics on everyone's tongues, but there are still some serious limitations to connecting your physical and digital worlds. There are ways that allow you to quickly trade contact information, but they can require both parties to download the same app and are difficult to coordinate in quick hallway conversations. Business professionals will tell you that you never know when you're going to meet someone who can tie together the pieces of a particular project, so it pays to be prepared to capture contact information regardless of your physical location. That's where business cards come in as one of the best ways to connect with people in person. Keeping your branding on point can be an ongoing challenge, especially as your business grows. Marketers must be diligent to ensure that all marketing materials are consistent and cohesive with colors, fonts, styles images, and even the tone of language that is used -- or your brand voice. One particular printed item that often ties together all of your branding is a simple business card! Business cards are relatively inexpensive but can pack a big branding punch when they provide each prospect or contact with the look, feel and logo of your business. 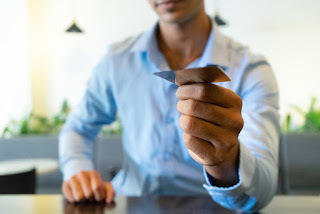 Business cards are one of the most convenient communication tools available because you can simply slide your hand into your pocket or purse and immediately be able to share your contact information with others. If you're in the middle of another conversation, there's no need to break off topic and attempt to program a number into your cell phone; instead, you can simply pop a business card into someone's hand! If you're at a conference or trade show, business cards allow you to jot questions or topics of interest on the back, which can help jog your memory of the contact and how you need to follow up with them in the future. Sending emails and even text messages may be one of the most effective ways to reach a wide range of individuals, but an old-fashioned phone call packs an impact. Including a handshake with your business card creates a personal connection that people will remember. If the person you're speaking with isn't the perfect contact for your business, the good news is that your business card can continue marketing to the next person who receives it, too! Digital marketing tactics such as QR codes add extra bang to your business card by providing your prospects with additional information that couldn't fit within the space available on a small business card. Have a special offer that you'd like to share? Drop a discount code on your business card and you'll be sure to create a lasting impression! Print marketing tactics such as business cards are still one of the best ways to reach your target audience in a personal way that builds long-term relationships. Business today is still driven by relationships. Ensuring that you have personal knowledge of the people you are working with -- and that connection -- is best formed by creative printed materials that reinforce the look and feel of your brand. The next time you're shaking hands with someone, be sure you're sliding a business card to them at the same time, and your message will be reinforced even after you are long gone!